Never lose a patient from your website, Twitter or Facebook again! 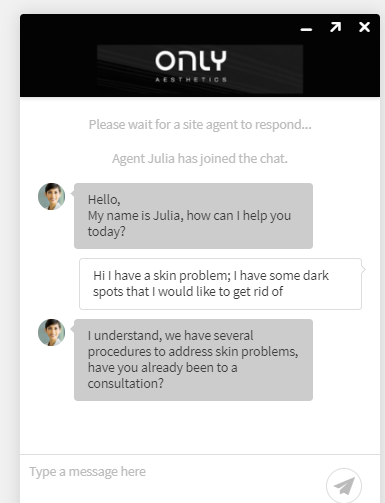 ChatPatient answers all your patients´ questions directly from your website and social media channels, with a dedicated team of agents trained specifically for the Aesthetic Industry. Internet traffic is the highest after clinic hours and on weekends. By integrating the 24/7 chat service from Chatpatient, you will have somebody talking to your patients with the medical knowledge of your assistant, and the sales experience of a sales professional. exactly how to convert your website visitors into patients. Most clinics have no time or budget to answer every chat request within seconds, especially after Business Hours. companies that waited 24 hours or longer. he or she gets a bonus. This keeps them motivated to generate leads from your website for you. bonus to encourage them to chat in the friendliest way. The Health Insurance Portability and Accountability Act (HIPAA) sets the standard for sensitive patient data protection. Since we offer our live chat service to the healthcare industry we made sure that our software and data processing is fully compliant with HIPAA. ChatPatient has Data Process Agreements with all its clients. We use world-class data centers to host our chat server farm. The data centers have state-of-the-art security measures and are compliant with standards of SSAE 16, CSAE 3416, and ISAE 3402. Are you ready to let us do the talking? Then contact us for a live demo, or click below to view our friendly pricing.